Like the awoken bear emerging from his cave come the warm season, so too does the modern office-employee venture outside out to seek mid-day nourishment. And in this outdoor-eating climate, the food truck has become the pinnacle of lunchtime convenience. But do you need to sacrifice trying to eat healthy with convenience? Tif Marcelo, author of North to You thinks not. Food trucks in moderation. Is there such a thing? My healthy-eating will power bends when there’s a food truck present, and when there are four or five around, it crumbles to dust. The experience of getting the meal into my hands is as exciting as the dish itself: the smell of food in open air, the heart-pumping walk up to the window for my turn to order, the shift of feet as I wait for my number, the weight of the meal in my hands when it’s passed to me straight from the line. The food is generally fast, yet uncompromising in taste and quality. The workers/cooks/chefs/owners are usually personable; frequent the truck enough and they’ll know you by name. It can be very addicting. How does one manage to eat healthy in a food truck environment? It all comes down information and choice. Look them up! – Food trucks are mobile restaurants that rely on word of mouth advertising, which means they most likely have a social media presence. Many trucks update their locations and menu in real time. Several apps exist that track food truck locations in your area, and menus, nutritional information, and reviews are available at the touch of a button. Dive in and get to know your local food trucks. Besides being informed before you arrive at that food truck location, the ordering process is quick, and you don’t want to hold that line up. Choose fresh or flavor! – With limited space on board, each food truck has a focus and their menu consists of only a few items. While it’s tempting to try it all—since food truck serving sizes might be smaller than buffet helpings—only pick one dish. But don’t just pick any dish. Either pick fresh, that is, the dish that’s closest to farm to table, or go all out and pick flavor, the special, the dish the truck’s known for. BUT skip the sides if you pick the special! – Food truck dining is all about the experience. If you choose to pick the truck’s special, which may not be the healthiest meal on their menu, skip the extras. The fries, the rice, the bag of chips, the soda—do these really add to the experience? Or will they simply add calories to an already hefty meal? Instead, enjoy the excitement of getting in an extra-long line, the ambiance of eating while standing or sitting on the sidewalk, of watching the world around you. Take the picture or selfie. Savor the dish. Frequent them less! – I know. I hate to be a killjoy but it’s the gosh darn, least delicious, and most painful truth. The temptation to order from a food truck when you pass one—especially one that’s hard to track down—is real. You want that food in your belly, that picture in your photo library. Sure, moderation is key, but less is better. Want to take a few more steps to eat healthy on a daily basis? 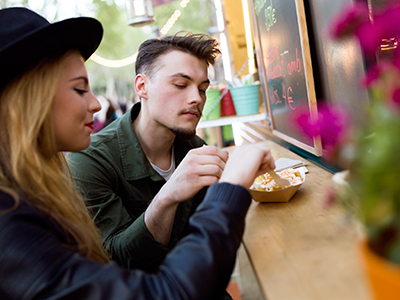 Try mixing in some simple, healthy meal planning with your visits to the food truck. 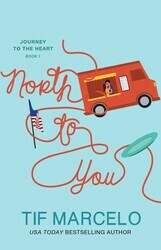 In this warmhearted and charming debut from Tif Marcelo, a food truck chef and her long lost Army love clash when they cross paths in San Francisco.Camille Marino has got a full plate. As the sole guardian of her eighteen-year-old sister and the head chef and owner of a food truck, she’s used to life being a juggling act. With food to cook, social media accounts to manage, and a little sister to look after, she doesn’t have time for much else. That is, until Drew Bautista walks back into her life. Drew is Camille’s former high school crush and he returns to San Francisco to repair his relationship with his father before he ships out for deployment. By helping his father renovate his failing Filipino restaurant, he hopes to win back his respect. But when sparks fly between Drew and Camille—his father’s major competition and sworn enemy—Drew is conflicted. Should he join his father in the war against her food truck? Or surrender to the woman who’s given him a second chance at love?